Today those of us in the USA celebrate Thanksgiving. I have much for which to be thankful. I’m thankful I beat the lung cancer odds and lived to see this day. No matter how much longer I may have, each day is a gift. I’m thankful for my family (whether related by blood, marriage, or adoption)—husband, children, siblings, nieces and nephews, cousins, and companion animals. I’m grateful for the time I get to spend with each of you. I’m thankful for my friends, who became family through shared interests and experiences. You bring me joy whenever we’re together. I’m thankful for the beauty and majesty of the Pacific Northwest, and the wondrous, awesome, fascinating universe in which it fits. I never tire of learning how it all works. I’m thankful for the arts. They stimulate my senses and inspire my imagination, often when I most need it. I’m thankful to have a home and enough resources to live comfortably. I know many people locally and globally are not so lucky. I’m thankful to live where I’m allowed to say what I think freely. I’m thankful for the researchers, healthcare professionals, organizations and techies that made it possible for me and other patients to live another day. I’m thankful for people who care for lung cancer patients. 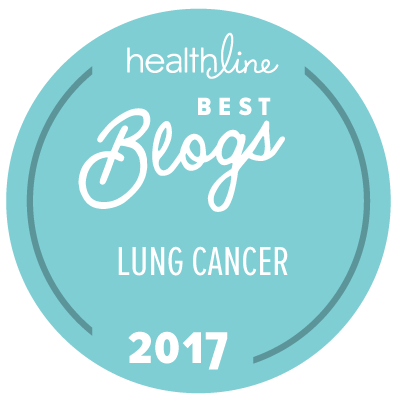 If a friend or loved one has metastatic lung cancer, ask if you can help them learn about mutation testing, targeted therapies, and clinical trials. You might help buy them more time. And more time is precious.